Ontario has not seen a great production of Molière’s Tartuffe since 1984. Then at the Stratford Festival John Hirsch directed Brian Bedford as the title hypocrite with Douglas Campbell as his prey Orgon, Domini Blythe as Elmire and Pat Galloway as Dorine. The production was a revival of the success from the previous year. The prospect that Soulpepper would be mounting Tartuffe this season may have raised hopes that we would see another fine production of this classic, but, alas, they are not realized. Diego Matamoros and Oliver Dennis are excellent as Tartuffe and Orgon, but the rest of the cast is terribly uneven. Director László Marton uses a rather heavy-handed concept and doesn’t really seem to connect with the play until Molière’s final two acts which occur after the intermission. Tartuffe was Molière’s most controversial play. Louis XIV, under the influence of the Catholic church, censored it after its first performance. Molière’s revision of 1667 was banned after its first performance and only Molière’s second revision of 1669 was allowed to be performed. By then Molière had finally convinced those in power that he was not criticizing religion in general but only the faux-dévots who misused religion for dishonest ends. The play finds that Orgon (Oliver Dennis) who wants to reform his life has been taken in by the religious hypocrite Tartuffe (Diego Matamoros). Orgon gives Tartuffe food and shelter, but in trying to demonstrate his own zeal, Orgon plans to let Tartuffe marry his daughter Mariane (Kat Gauthier), who is in love with Valère (Gordon Hecht). When Orgon’s son Damis (Colin Palangio) catches Tartuffe making improper advances toward his stepmother Elmire (Raquel Duffy), Orgon, to repair the insult, disinherits Damis and signs over all his property to Tartuffe – thus putting himself and his entire family in the hands of an impostor. Marton is quite aware that the word hypocrite derives from the Greek word ὑποκρίτης meaning “actor”. Therefore, when we enter the Baillie Theatre at the Young Centre, we see racks of costumes on stage, a ghost light, parts of the set turned back to front and Brenda Robins downstage left putting on makeup to prepare herself for her role as Madame Pernelle. On the one hand, this pretense of showing us the actors entering and choosing their costumes as if it had not all been arranged before has been done so often now it is wearing quite thin. To use four different cues to tell us that the play is a play and the actors actors lacks subtlety. On the other hand, Laszlo has the actors consider 17th-century French costumes and then reject them in favour of contemporary garb, handily making the point that the Molière’s satire of hypocrisy has universal application. Unfortunately, Marton cannot stop emphasizing the idea of artifice. The five pieces that make up Lorenzo Savoini’s rather plain set are not all turned the right way round until Madame Pernelle exits after her tirade against her son’s family. Even then, although there are three doorways, characters like Damis and Dorine (Oyin Oladejo) will push parts of the set apart to peek through, making us aware yet again that the set is a set. Not only are we to see that the bare stage has been disguised as a room by use of a set, Marton wants us to notice that ordinary furniture can be disguised as elegant moveables by cloaking them in large lengths of damask. Thus, everything is disguised, just as Tartuffe cloaks his carnal and mercenary intents in feigned religious piety. This is all very well, but Marton really doesn’t need to hit us over the head with the idea yet again by beginning the action after intermission with the costume racks back again on the stage. Among the Soulpepper troupe, Diego Matamoros and Oliver Dennis are the ideal choices to play Tartuffe and Orgon. As with his concept, Marton’s vision of Tartuffe is not as subtle as it could be. To Marton, Tartuffe is basically a coarse criminal and con man with Orgon and his family simply his latest victims. At his first entrance Laurent (Frank Cox-O’Connell), Tartuffe’s servant, already appears more like a henchman. The humour in Tartuffe’s first interview with Elmire comes from Matamoros’ showing us how the supposedly pious man can barely restrain himself from launching an attack on her. In other productions, such as the one at Stratford in 1983, much more humour can be created if sexual allusions in Tartuffe’s speech remain ambiguous. This helps make Damis’s assault of Tartuffe appear less justified and makes the need for the table trick of Act 4 even more necessary. By making the Tartuffe’s intentions so explicit so early, Marton doesn’t leave Matamoros much room to go further which forces him to make the famous table scene much raunchier than usual. Matamoros is wonderful at conveying Tartuffe’s slimy, predatory nature, but what we don’t see enough of is his pious side that has taken in both Orgon and Orgon’s mother. After his exposure as a fraud, Matamoros makes Tartuffe’s transformation to pure villainy absolutely chilling. A question Molière never answers is why Orgon should have been gulled by this particular type of con man. The general assumption is that Orgon has suffered some kind of crisis of faith and feels he needs a religious guide. We do know that Orgon agreed to hide incriminating papers of a friend of his involved in the Fronde rebellion (1648-53) against the monarchy and the political influence of the Church. In his sensitive performance Dennis seems to have completely absorbed this backstory so that his defence of Tartuffe appears to be a defence of some aspect of himself. Dennis makes Orgon’s overabundant charity to Tartuffe seem as if it were an effort to save Orgon’s soul. Raquel Duffy could be a fine Elmire, but she portrays her character as unusually calm and self-possessed considering her strange situation of having a guest in the house she does not trust. It would help if she would let us perceive some underlying apprehension or resentment. The result is that there is less tension in her encounters with Tartuffe than there logically should be. The rest of the casting is peculiar. Brenda Robins, who more realistically could play Oliver Dennis’s sister, play his mother, and Gregory Prest, who could easily play Dennis’s son, plays Elmire’s brother Cléante. 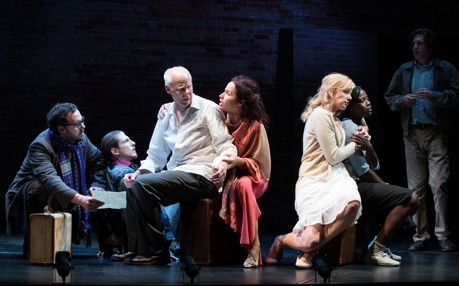 Could Soulpepper not find actors of the right ages to play these roles? In the event, Robins’ skill at acting makes her a convincing Madame Pernelle, but Prest’s youth is only emphasized by his student-like costume, thus removing even more of the authority that his character should have as the classic raisonneur of the piece. The rest of the main roles are played by recent students. Marton seems not to realize that the maid Dorine is one of the most important characters in the play since she even more than Cléante represents the voice of common sense. If Marton has cast an experienced actor like Prest as Cléante, it is even more important that he do so with Dorine. Oyin Oladejo does her best but she simply not yet prepared for such a part. Her resources of tone and gesture are still too limited. She speaks translator Richard Wilbur’s verse well but always with the same inflection no matter what the situation. In her first encounter with Orgon, who asks only after Tartuffe’s health instead of Elmire’s, she should show some rising anger in her replies, but she does not. Colin Palangio as Damis, Kat Gaulthier as Mariane and Gordon Hecht as Valère all suffer from the same lack of voice control. The only sound level they have above mumbling is shouting, or in the case of Gaulthier, screaming. This makes understanding, let alone caring about their characters quite difficult. Marton is fully aware that Molière ends the play with a deus ex machina in the form of the Police Officer. Marton knows that such a device only emphasizes how otherwise insoluble the situation is that Orgon and his family are in. The set walls come apart, a little red carpet rolls out and a miniature coach rolls in bearing the letter from the King that solves everything. Peter Fernandes endows the Officer with as much grandeur as he can, but can’t create the sense of supreme authority that should accompany it. Soulpepper has thus missed the chance to bring us a fine Tartuffe. This is a pity on many counts since neither Soulpepper nor Stratford have exactly been exploring Molière’s works in any systematic way. At least Stratford does a Molière about every five years, whereas Soulpepper has not done one since School for Wives in 2000. It’s a play any classical theatre company should be able to master. Let’s hope the next company that stages it is up to the challenge. Photos: (from top) Raquel Duffy as Elmire and Diego Matamoros as Tartuffe; Gregory Prest, Colin Palangio, Oliver Dennis, Raquel Duffy, Katherine Gauthier, Oyin Oladejo and Gordon Hecht. ©2014 Cylla von Tiedemann.